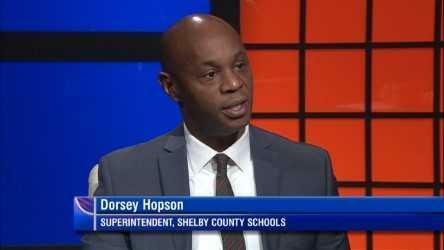 Shelby County Schools’ Superintendent Dorsey Hopson will be leaving his position in January to take a new job with Cigna. This week on WKNO-TV's Behind the Headlines, Hopson joins host Eric Barnes to talk about some of the challenges he faced during his five years as head of Tennessee's largest school district. One of his first milestones was the merger of Memphis City Schools and Shelby County Schools at the onset of his tenure in 2013. Hopson explains how he tackled the district's $100 million debt and $70 million deficit. Hopson takes pride in leaving Shelby County Schools with a balanced budget. Hopson talks about some of the future issues awaiting his successor, but because of budget stability, the new Superintendent will be able to make investments that can impact the future of Shelby County Schools. Other issues: poverty among SCS students, and his reasoning for endorsing Governor Bill Lee.